The way decisions are made, whether people are encouraged to be serious or playful , how risk-averse or innovative and entrepreneurial the company is – all of these are elements of your company culture. A way of describing culture is ‘the way we do things round here’. It affects every aspect of how an organisation operates and how work gets done. In a small business, often little thought is given to the culture. It comes naturally from the founder/owner’s own values and way that they operate and is typically not formalised. 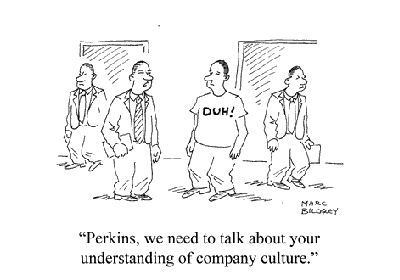 Yet your company culture is often a huge factor in your company’s success. As your company gets bigger and more successful, the culture and values that led to this success can start to take on a life of their own and become diluted as others join the business. How do you maintain culture and values as you grow? Reports are that the SME sector will be five times more likely to grow their headcount than larger organisations during the remainder of this year. Due to this, The Chartered Institute of Personnel and Development (CIPD) has published a report on the importance of keeping culture, purpose and values at the heart of your small business, to enable sustained business success. Ensure a shared understanding of the business’s founding purpose and values. As the business grows, you can’t rely on people ‘just getting it’. Introduce more formal communication mechanisms to keep people focused on the ‘why and how we operate’. When you get to a certain size, more planned and formal communication is needed to make sure everyone is getting the same messages from the top. Recruit people whose personal values and way of working match the business. Unlike skills, values cannot be taught or learned, but are innate. Make use of an induction period when new employees join, so that they can observe and become familiar with how the business operates. Design your induction to ensure everyone understands the ‘way things are done round here’. Keep job descriptions flexible and create opportunities for people to get involved in innovative projects. This can help retain those people who joined the company in the early days who feel engaged by a varied job role. Evaluate employee performance in line with the culture and values you want to maintain. The way inappropriate behaviour is addressed and desirable behaviours are rewarded sends strong signals to people about what kind of company you are. Adopt an approach to reward that is consistent with your culture. There are simple and zero-cost things that organisations can do to reward behaviour, the most common (and easiest!) one being managers acknowledging people’s contribution with a simple thank you. Offer development opportunities – this sends a strong signal to employees that they are valued and that looking after your people is a key part of what you’re all about. Be prepared for people leaving the organisation. When the workforce is small there is often just one person doing a certain role. Losing a key person can mean you also lose all of the technical and tacit know-how they have about their role and the wider company. Cross training can help with this, and also provide cover for holidays or sickness. Developing a succession plan is also important so that you can look to fill key roles internally, helping to promote employee development and maintain and strengthen your company culture. You’ve advertised the job and shortlisted your candidates – now it’s time to interview them. Here are some pointers for ensuring that your interview process is as effective as possible – saving you time and money. 1. Identify beforehand which areas you want to find out more about. In my article on shortlisting candidates effectively, I referred to the job description and person specification, which really sets the foundations for your recruitment activity. If you have a job description and person spec, you will already have spent time identifying the job holder’s key activities, and hence the knowledge, skills and behaviours they will need to display. This should then form the basis for your line of questioning. This may sound obvious, but you wouldn’t believe the number of managers that I’ve interviewed with, who have grabbed the CV literally minutes before the interview without having had chance to read it. Reading (or re-reading) it beforehand will remind you of the candidate’s work history and allow you to identify key points that you want to pick up on – perhaps a certain project that’s relevant to the role, or an unexplained gap. In the event that you’ve not had time to read through it, a question such as ‘talk me through your CV’ will buy you a little time, but you’ll still need to have a clear idea of what you‘re looking to assess in the interview. 3. Try to set the interviewee at ease. You’ve invited the candidate to interview because you think they may have just the right combination of skills and abilities that your company needs. It’s in your interest therefore to put them at ease from the outset, so that they are able to perform at their best in the interview. A few social niceties about their journey to your offices will usuallydo the trick here, as well as offering water or a coffee, followed by a brief explanation of the format of the interview. Again, this may sound obvious but can sometimes be forgotten when you have a busy schedule to get through. The extent to which you feel at ease also has a huge impact on your candidate. Ensure that you are prepared for the interview, know what you want to ask, and know who you are going to be interviewing. This helps to convey a professional image and will make you feel more comfortable in the interview, which in turn will make your candidate more comfortable. That’s not to say that you can’t be challenging and put the applicant under pressure, but doing this in a situation where you have tried to remove some of their nerves at the outset is likely to give you a truer picture of their capabilities. “Tell me about a time when you’ve had to deal with a difficult customer”, “describe a time when you had to manage multiple conflicting priorities”. Okay, so these could perhaps be described more accurately as commands rather than questions (!) but asking open-ended questions such as these will elicit far more information, more easily, than their closed counterparts – “have you ever had to deal with a difficult customer”, “have you ever had to manage multiple conflicting priorities”. Also, remember that candidates usually have some degree of nerves (and some people are more literal than others). Starting your questions with what may feel like a slightly more polite ‘can you tell me about…’ may result in the simple answer ‘yes’ rather than the full-flowing description that you are expecting! If there is certain factual information that you need to clarify, then a closed question (requiring a yes or no answer) is more useful – for example ‘Do you have a driving licence?’. Don’t be afraid of silences from the candidate. You’ve asked them a question which they may not have an immediate answer to, so it’s fine to let them consider their response in silence for a moment or two. Avoid jumping in with a follow-up question, or further clarification straightaway, as this can potentially be confusing and could give the impression that you, the interviewer, are flustered. If after half a minute or so they haven’t been able to give a response, then that’s useful evidence in itself and you can move on to the next question. Under the Equality Act 2010, examples of questions that you can’t ask (as they are considered discriminatory) include asking about nationality, ethnicity, marital status, children, sexuality and age. Make the most of your interview time with the candidate – ensure you understand the context of their examples, the action they took and the outcome. If this isn’t clear then dig into their initial answer with further probing questions and avoid making assumptions on what they did, based on your own knowledge and experience. 8. Don’t ask ‘wacky’ questions because you think everyone else is. ‘If you were a biscuit, what kind of biscuit would you be?’ This type of question has become more popular with companies in recent times, in a bid to uncover a candidate’s personality in the interview, or to see if they have a sense of humour. Such questions can have a place in the interview process, but only if you know how the answer is going to contribute to your assessment and comparison of candidates. Avoid asking the quirky question just because you want to look like a fun employer. 9. Be prepared for the candidate to ask you questions. When deciding how much time to allow for an interview, ensure that you allow some time at the end for the candidate to ask questions about the job and company. It’s important to be honest in your answers. If you give applicants a false impression of the job or the company, then there’s likely to be trouble ahead when they join and find that the role doesn’t meet their expectations. Be prepared for the candidate to ask you what happens next in the process. Think through in advance what your timeframe for decision making is likely to be, and how you will contact candidates to advise them of the outcome. 10. Keep notes of the interviews. When you’re seeing several candidates in one day it can become difficult to remember the detail of everyone’s responses. Once you’ve completed the interview process, it will be much easier to compare and rank the candidates if you have detailed notes. These will help you to remain objective and look at the evidence the candidates have provided against your criteria rather than rely on memory, or impressions from the interview. Avoid writing anything in your interview notes that you wouldn’t wish a candidate to see, as they can request to see them. So there you have it, ten tips for ensuring that your interview process runs as effectively as possible. If you’d like to learn more about how to select the right candidate for the job, or find out how The People and Project Consultancy can support your interview process, then please contact Claire Carr on +44 (0) 7929 021850 or email claire@peopleandproject.com. Q: How do you make sure you only employ lucky people? A: Throw away half the CVs you receive without even looking at them! As well as making me smile, it did get me thinking about candidate short listing, and I thought I would share some hints and tips with you to help save you time and money when recruiting. Hopefully, you will be starting your candidate short listing process with a list of essential and desirable experience, skills and attributes that you drew up before you advertised the role. If not, then you might find it helpful to get some assistance with putting together a job description and person specification. As well as supporting the short listing process, these two documents will help you avoid any potential discrimination in your job adverts. I recommend that you use a simple scoring system to evaluate each CV objectively against your criteria. This could consist of a 0-3 scoring system, with candidates scoring zero if there is no evidence of the criterion in their CV, up to a score of 3 if there is strong evidence. (A score of 1 would denote some evidence but weak, a score of 2 would denote clear evidence.) Before you start the scoring it’s important to have clarity in your own mind, about what you’re looking for at each level of scoring. Before reviewing CVs against your short list criteria, decide if there are any ‘deal breakers’. If you have a specific requirement that is non-negotiable, such as an accountancy qualification if the role is for a qualified accountant, then check the qualifications sections of the CVs first and weed out any without it. There’s no point scoring the CV on any of the other elements if this is an essential requirement. You will also need to decide on a benchmark score – candidates who score the benchmark or above will be the ones whom you invite for interview. You can do this before or after you score the CVs, although you are likely to be more objective if it you do it beforehand. The level at which you set your benchmark may be dependent on several factors – strength of the job market, the number of CVs you receive, whether you want the ‘finished article’ or are prepared to offer coaching and training to a candidate who has some but not all of the right skills and experience. A suggested benchmark if you have six criteria against which you are scoring would be a score of 11. This would mean that candidates who are short listed to the interview stage have provided strong or clear evidence in their CV of the skills and attributes you are seeking, with room to drop a couple of points where perhaps the evidence is slightly weak, or it’s unclear from simply reading their CV. Once you’ve scored all your CVs, review your benchmark. If you find that you have a large number of candidates that meet this benchmark then you could consider raising it, so that you short list only those that score 12 or above for example. If you have very few CVs meeting your benchmark then you could consider lowering it slightly, in order to see a wider pool of candidates at interview. You should be fairly cautious when doing this however, as you could end up wasting valuable time interviewing candidates who are not suitable for the role.